Since its independence in 1960, the Democratic Republic of the Congo (DRC) has struggled to devise institutions that can provide effective governance for its vast and diverse land mass and for its diverse and long-suffering people. 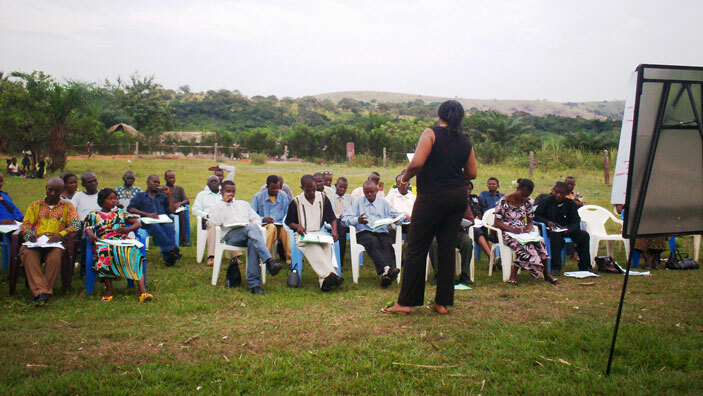 The Programme de Bonne Gouvernance (PBG), or Good Governance Program, works to improve the management capacity and accountability of select legislatures and local governments by working closely with civil society and community-based organizations, parliamentary institutions at the central and provincial levels, and public institutions with a stake and role in decentralization. Award grants to support advocacy of more effective budget execution and development. Advocate for better protection of small farmers against illegal taxation and land tenure insecurity, for better fiscal management, for action on health issues, and against corruption. Identify pilot projects in sectors where public-private partnerships can take hold. Help create 12 local government action plans and monitoring and evaluation workshops with stakeholders in decentralized local government to assess the impact of training on their daily work. Established four Centres des Resources pour le Democratie as hubs of learning for project stakeholders and partners in Bandundu, Katanga, South Kivu, and Maniema provinces. As a result, legislators committed to organizing public hearings during the next parliamentary session and invited testimony from civil society. Completed two pilot studies on transparency in local finances and the fight against corruption, enabling local actors to set up mechanisms to reduce corruption and increase incomes. Organized a women’s roundtable leading to the creation of a network of women leaders in the public sector. Increased income by 76 percent between 2011 and 2013 and by 174 percent between 2012 and 2013. Prior to the project, from 2009 to 2010, the rate was 8 percent. Created a budget committee at the Mayor’s office comprised of civil society members. Established and rendered operational a taxpayers database for the City of Bukavu which currently registers more than 7,500 taxpayers. The Iraq Governance and Performance Accountability (IGPA)/Takamul porject supports the Iraqi Government to shore up fiscal stability while rapidly and visibly improving service delivery.